"No sight that the human eyes can look upon is more provocative of awe than is the night sky scattered thick with stars. But this silence made visible, this silence made audible, does not necessarily give rise to a religious mood. It may evoke a mood that neither requires nor postulates a God. On frosty January nights when I walk over the downs I feel myself to be passing through a lofty heathen temple, a temple without devil-affrighting steeple bells, without altars of stone or altars of wood. Constellation beyond constellation, the unaltering white splash of the Milky Way, and no sign of benison, no sign of bane, only the homely hedgerow shadows and the earth's resigned stillness outstretched under the unparticipating splendour of a physical absolute." Llewelyn Powys was born in Dorchester, Dorset, spent his childhood at Montacute, Somerset, and as an adult lived for varying periods in Kenya, the United States, Dorset and Switzerland. His twenty-six books include a novel, Apples be Ripe, a biography, Henry Hudson, essays descriptive and polemical, memoirs and reminiscences. Of all the Powys brothers, Llewelyn was recognized as the most cheerful, the most at ease with existence: the only one for whom a title such as Glory of Life could hold not a shadow of the ironic. Llewelyn's epicurean philosophy is intimately related to the tuberculosis with which he struggled for thirty years. Among Llewelyn's best books are Black Laughter, about life in Africa, Skin for Skin, a memoir of his first attack of tuberculosis and residence in a Swiss sanatorium, Impassioned Clay, a statement of his philosophical outlook, the essays collected in Earth Memories, Dorset Essays, Somerset Essays and Swiss Essays, and the fictionalized autobiography Love and Death. 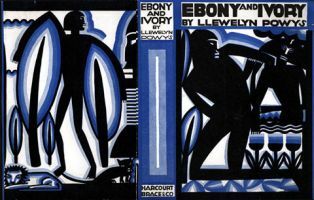 In their blend of the descriptive, the reminiscent, and the polemical, Llewelyn's best writings have retained both their urgency of appeal and their charm of evocation. 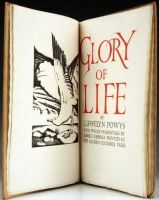 Malcolm Elwin, his first biographer, described Llewelyn Powys as 'a philosophical poet relating the pleasures of his senses in the purest prose of his time'. By the spring of 1911, the writer Llewelyn Powys (1884-1939) – then only 26 – had spent eighteen months at a Swiss sanatorium, being treated for the tuberculosis which the previous year had nearly killed him. Still frail, he returned to England, and to Montacute, the Somerset home of his family, where his father had been vicar for 26 years. Like Katherine Mansfield’s journal from the same period, Llewelyn Powys’s diary is a major record from inside the consumptive experience and adds significantly to our understanding of the ordeal of this deadly and durable disease in the first half of the twentieth century. An extract from The TLS review (August 20th, 2015) by Michael Caines. John Gray looks to history to argue that it's time to rethink today's narrow view of atheism. He ponders the lives of two little known atheists from the past - the nineteenth century Italian poet Giacomo Leopardi and the Somerset essayist and novelist Llewelyn Powys. He says their work shows how atheism can be far richer and subtler than the version we're familiar with. "The predominant strand of contemporary unbelief, which aims to convert the world to a scientific view of things, is only one way of living without an idea of God" writes Gray. First published in 1925, Skin For Skin is a deeply personal account of Llewelyn Powys’ encounter with tuberculosis, which he contracted in 1909 at the age of twenty-five. In those days, prior to the discovery of antibiotics, TB - or consumption as it was then called - was a leading cause of death; for Powys, the bubbling sensation in his lungs and the blood in his mouth amounted to a sentence of death. In the pages of this uncompromising memoir we accompany him to a Swiss sanitarium to recover his health, then back to the south of England for a period of convalescence, hoping that the symptoms of the “hideous complaint” do not return. And yet, despite the soulless darkness, there is reason for existence. As we see in Skin For Skin, Powys finds it in enjoying life to the fullest, in feasting upon it while he has it, in squeezing the last drop of joy from each day. As the Brooklyn Daily Eagle concluded in its review in 1925, "Rugged, brutal and yet, in spots, tender, Skin For Skin makes life worth living after all." 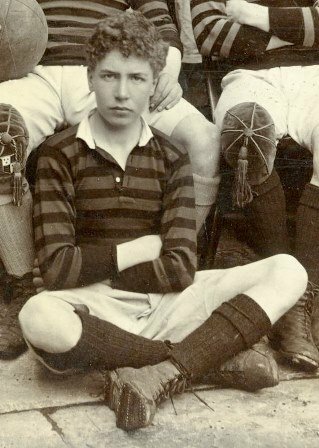 Llewelyn Powys (1884-1939), novelist and essayist, was born at Dorchester, Dorset, on 13 August 1884, and educated at Sherborne School, 1899-1903, and Corpus Christi College, Cambridge, 1903-1906. He was a stock farmer in Kenya, 1914-1919, and a journalist in New York City, 1920-1925. 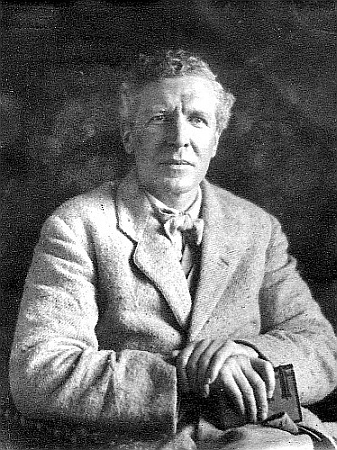 After marrying Alyse Gregory (1884-1967) in 1924, Llewelyn returned to the Dorset headland and travelled with his wife, paying visits to Palestine (1928), and the West Indies (1930). He and Alyse lived at Chydyock Farmhose where he continued to write many dozens of essays. He died in Switzerland on 2 December 1939. To anyone with good eyesight, the great promontory of Bats Head can be seen from Weymouth Esplanade. 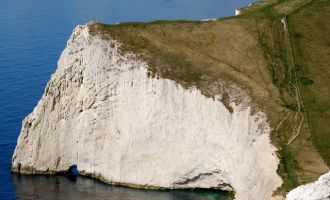 It projects into the sea a few miles to the west of Lulworth, and far below on each side of its perpendicular chalk face lie two deserted beaches, the one to the east falling away to the Durdle Door, and the other to the west extending as far as White Nose. It is a remarkable headland. On afternoons of the wildest weather a man may rest here in tranquillity, some peculiarity in the structure of the cliff causing the rushing gales to cast themselves straight up from its sheer walls, so that the crest of the headland remains in an absolute calm. Seated on this halcyon ledge it is possible to observe in peace the riot of the sea-coast below; to look down upon great black-backed gulls flying in wide circles along the margins of the breaking waves; or to watch at close quarters the cormorants pressing their bodies in mid-air against the wind, their black necks tilted upwards. There is something outlandish and forbidding about cormorants. Milton must have recognised a turpitude in them or he would never have made Satan select this particular disguise for entering the tropical acres of the Garden of Eden. How obstinate an egoism have these gluttonous sea-crows! Wherever they are it is the same, whether settling upon the water like mallards, or in groups upon a rock stretching out their wings like black fans to dry, or when, with the deliberation characteristic of them, they sweep forward through a marine twilight to their selected roosting places. What secret mandate are they obeying on such occasions? At whose word do these impious birds direct their unerring flight over the face of the waters? Bewick says that in some parts of the world men make leather jackets out of cormorant skins. How admirable to be defended against wind and sleet by a jerkin of cormorant pelts! In the reign of Charles I the position of Master of the Cormorants was a much-prized office – and no wonder. Who could aspire to a more impressive and singular title? Imagine the curtains of the royal audience-room thrown open and the doorkeeper announcing the entrance of so carefree a functionary! In sophisticated subtlety the cormorant is not to be compared with the guillemots. There is a narrow ledge halfway up Bats Head where the guillemots have congregated in the nesting season for time out of mind. Here they will stand for hours upon their black webbed feet, nodding like punctilious mandarins at each other, until embarrassed by their own self-conscious manners they dive off from their chalky platform, and with their odd mechanical flight circle down to the sea. With us the return of the guillemots each spring is a recording place in the advance of the seasons. ‘The foolish guillemots have come,’ we say, as others speak of the first arrival of the swallows. What a commentary it is upon the brutal insensitiveness of man that these refined birds should have won for themselves the epithet of foolish; foolish, forsooth, because ‘in their piety’ they will remain upon their eggs until fishermen can catch them and wring their necks. It is, of course, the herring gulls which through spring, summer, autumn, and winter, make up the real bird-population of these cliffs. It is their hungry call that first breaks the religious stillness of the winter dawn, vexing the waking dreams of the countrymen with their wild insistent crying, before even the red glow is to be seen through the lowest branches of the naked hedge. It is these birds which may also be seen walking on the grasslands in November, white as a flock of fairy-tale geese, or rising up suddenly out of rain-soaked stubble, like a shower of snow in a child’s glass ball. At this time of the year they come in from the restless sea, from the ridged weed-drifting margins of the shingle, to glut their insatiable appetites upon the lowly victuals of the soil. Up into the cloudy winter sky they mount with their free strong flight, a flight so different from that of a chapel of starlings suddenly flushed and close-clustering as a swarm of bees. How the knavish cliff-jackdaws are forever striving to imitate the balance, the aerial poise, of these incomparable white birds, and yet for all their javeline dartings they can never escape the ordained limitations of their being. The White Nose ravens seem entirely to disregard all other fowl. Their dark shadows cross and recross the sloping shoulders of the downs, but they are always flying alone, the male and the female, with solitary, mutual love. In February, when they prepare for their first clutch of eggs, they are self-sufficient, and in mid-winter, when they come in over Swyre Head after a morning’s scavenging on the Chesil Beach, it is the same. What a massive self-absorption is suggested by the croak of a raven, as it disturbs the stillness of a Sunday afternoon far up above the gorse and carline thistles. No wonder to primitive minds this harsh utterance seemed to conceal hidden meanings, dark occult messages, decrees of a dolorous Fate. There is only one pair of ravens nesting now at White Nose. Each autumn they drive their offspring westward. These unnatural battles usually take place above the undercliff, towards Ringstead. I was once told by the late Mr Hardy that when he was a boy it was a common thing to see village people bless themselves as these birds flew above the thatched roofs of their cottages far inland, so that seventy or eighty years ago ravens must have been less rare in Dorset than now. Aloof though the White Nose ravens are there is one bird that breaks in upon their proud isolation. For some obscure reason the heavy, dark flight of these giants of the air is exasperating to peregrine falcons. The war between the ravens and these hawks is as perennial as the traditional contest between pigmies and cranes. A peregrine falcon will pester a raven in its flight for several miles together, soaring high up above it and then with a deadly swoop darting downwards. I have seen them knock feathers out of the raven’s body, but never do serious harm, and it is astonishing how the great bird knows when to turn upon its back in mid-air at the very instant when in its downward rush the peregrine is ready to strike. If the peregrine’s attacks become too insistent the raven will fly to the ground, and whenever it is driven to this extremity the hawk will molest it no further, appreciating, I suppose, how formidable a weapon is its heavy, black, hollow beak – a true Saxon battle-axe! Men have sought for the secret of life in temples and in cathedrals. They have worshipped in moonlit groves and before the sacrificial stones of monolithic circles. With closed lips and shut eyes they have waited and listened for God in cornfields and vine- yards. I think there are few places more fitted for such moods of religious receptivity than is this undisturbed sea-cliff. Here for thousands upon thousands of years the sunlight and the sea and the masterless winds have held tryst together, and nature, under the sway of so mighty a trinity, shows without reluctance her hidden moods, moods violent and material, moods of a severe and chaste beauty, and moods that are full of a deep and tremulous earth-poetry.